A RED ALERT is being maintianed in the communities of Pococí, Guácimo, San Carlos, Siquirres, Upala, Los Chiles, Guatuso, La Cruz de Guanacaste, Sarapiquí, Río Cuarto de Grecia, Pacuare, Parismina, Barra del Colorado, Barra del Tortuguero, Puerto Lindo and Delta Costa Rica. 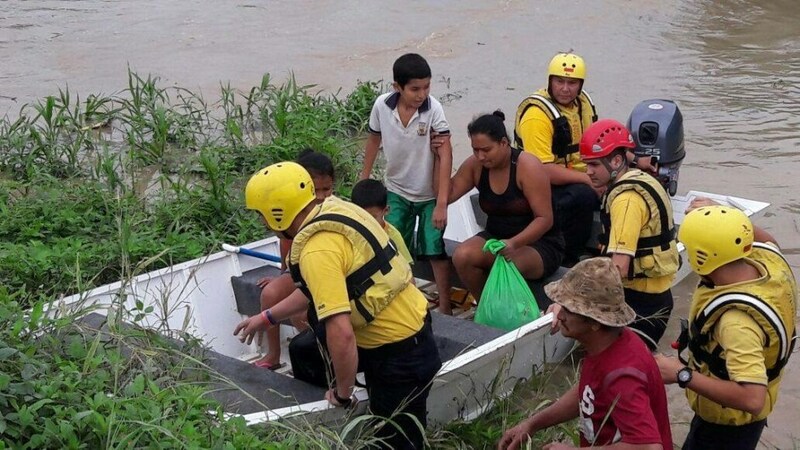 Q COSTA RICA NEWS – “This is not a rainfall,” were the words of Costa Rica President Luis Guillermo Solis this morning following hours of early morning meetings with a group of legislators and heads of various national relief and emergency support committees. The meeting at Casa Presidencial began before 7:00am. Shortly after 9:00am, President Solis in a press conference took the opportunity to remind the population to not let the guard down given the downgrade of Otto back to a Tropical Storm and that what is coming our way is not the typical rains Costa Ricans are accustomed to. 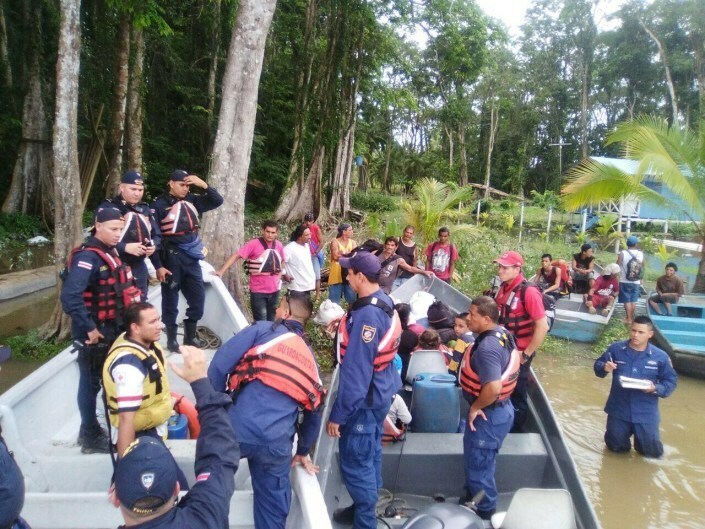 In the coastal area of the provinces of Limon and Heredia, water is knee-deep and more in many communities, all affected from “heavy” to “torrential” downpours and sustained winds. Evacuations and relief efforts are underway. Authorities this morning updated that Otto will hit by late Wednesday night or in the early hours of Thursday morning, which is currently (at the time of this post) some 100 kilometres off Costa Rica’s Caribbean coast. Landfall had been expected by 1:00pm Wednesday. Officials at the Instituto Meteorológico Nacional (IMN) – national weather service – say that Otto will probably hit Costa Rica as a Category 1 hurricane. If the landfall does occur, this will be first time direct impact for the country. According to the director of the IMN, Juan Carlos Fallas, the downgrade accelerated the effect on the country. “With the information we have at this time the storm would reach Central America as a Category 1 hurricane,” Fallas said. The RED Alert is maintained in 18 cantones (counties) in the Caribbean, Northern Zone of Alajuela, La Cruz in the northern part of Guanacaste, and Sarapiqui de Heredia: Pococí, Guácimo, San Carlos, Siquirres, Upala, Los Chiles, Guatuso, La Cruz de Guanacaste, Sarapiquí, Río Cuarto de Grecia, Pacuare, Parismina, Barra del Colorado, Barra del Tortuguero, Puerto Lindo and Delta Costa Rica. A YELLOW ALERT is maintained for all other areas of the country. So far 161 communities have been affected, 46 of which have been cut off due to flooding and 3,000 people evacuated from their homes. Ivan Brenes, head of the Comisión Nacional de Emergencias (CNE) – National Emergency Commission – said that 1,183 homes so far have been affected by the rains and water levels, explaining “climate has not helped us to take care of these communities, because the rain has complicated the work of air rescue”. According to the CNE, some 1,040 people are now in 13 ‘active’ shelters in the Caribbean and Southern Zone. In Nicaragua, the community is Bluefields is getting ready for a stong impact, a stark contrast to the unpreparedness of 28 years ago when it faced Hurricane Joan. In Panama, four people lost their lives on Tuesday from the heavy rain.